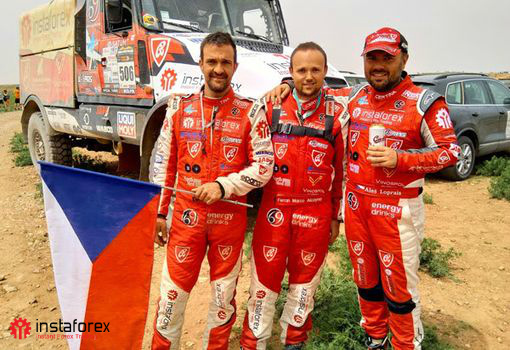 The team’s leader Aleš Loprais together with his crew that included Ferran Marco Alcayna and Petr Pokora came first in both the truck category and the overall standings of the African rally in Morocco. “This race is a part of our Dakar 2019 mission and it’s really nice to win like this. It was a very difficult African adventure, but a successful one, a golden one. I’d like to say thank you to the guys in the cabin, to our mechanics and also all our partners for their support,” Aleš Loprais said after the finish. The crew solved technical problems successfully. They even managed to deal with three tire punctures that occurred during the second stage. Thus, the team consolidated its lead in the overall standings with the result of 31:02:08 hours. “Punctures are just part of this difficult competition. I can’t wait for the next challenge,” Petr Pokora added.